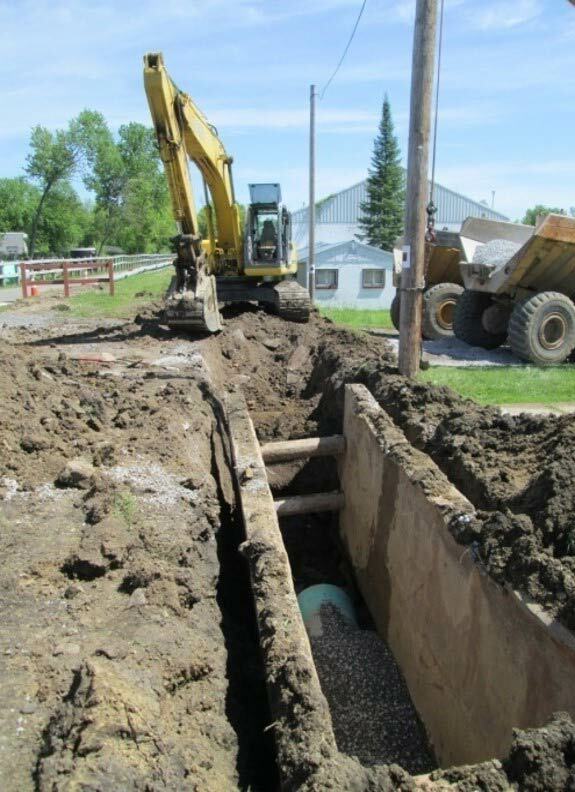 Beginning in 2012, CT Male Associates started investigation work on the Gloversville-Johnstown Joint Wastewater Treatment Facility Trunk Sewer. 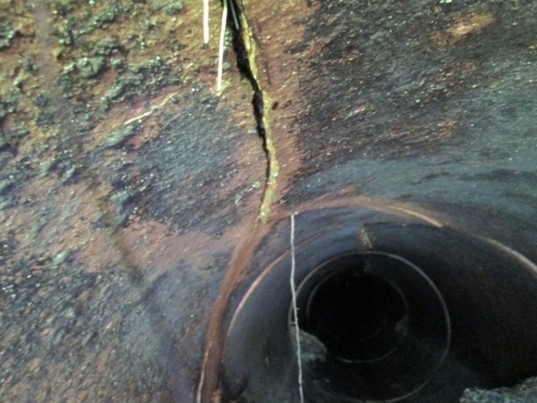 The Trunk Sewer has been in service for approximately 50 years. The route of the pipeline follows the approximate path of the Cayadutta Creek and right-of-way of the abandoned Fonda, Johnstown, and Gloversville Railroad, now the F, J, & G Rail Trail. The length of the Trunk Sewer is approximately 19,750 feet and ranges in size from 24-inch diameter to 42-inch diameter. Since the time of construction, neither video inspection work nor cleaning has been completed on any sections of the Trunk Sewer. Based on the history of the area, there was concern over the condition of the structures (manholes and pipes) due to the wide use of industrial chemicals, largely due to the leather tanning industry, discharged into the Trunk Sewer and the historical presence of hydrogen sulfide gas. This section of Trunk Sewer was investigated primarily for infiltration and inflow and structural problems due to the above conditions. After a complete condition assessment of the trunk sewer system, C.T. Male Associates put together a long term plan for maintenance, budget cost estimates for capital planning, and prioritization of maintenance and replacement projects to support a funding strategy. Once the trunk sewer investigation was completed, repair projects were given an estimated cost and prioritized. Priority 1 projects were suggested to be completed in 0 to 5 years. Priority 2 projects were suggested to be completed in 5 to 15 years. Project No. 1- Cleaning 12,405 linear feet of trunk sewer. This was deemed a priority 1 project with an estimated cost of $130,000. Project No. 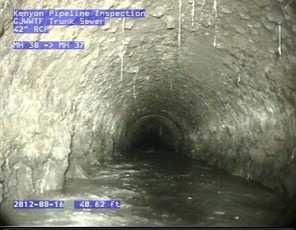 2- Clean and line 4,182 linear feet of trunk sewer. This was deemed a priority 2 project with an estimated cost of $1.8 million. Project No. 3- Clean and video camera inspection of 6 sections of trunk sewer that were not accessible during the first phase of the work. This was deemed a priority 1 project with an estimated cost of $27,420. Project No. 4- Clean and Line Manhole 17 to Manhole 16 and replace Manhole 17. This was deemed a priority 2 project with an estimated cost of $253,270. Project No. 5- Replace Manhole 23 and 24; clean and line 145 feet of 42″ Reinforced Concrete Pipe; and clean and line 210 feet of Ductile Iron Pipe. This was deemed a priority 2 project with an estimated cost of $155,360. Project No. 7- Replace Manhole 42 & 43, and replace 216 feet of 36″ Reinforced Concrete Pipe. This was deemed a priority 2 project with an estimated cost of $202,690. Project No. 8- Replace Manhole 94,95,96,97,98 and replace 1,263 feet of 27″ Vitrified Clay Tile Pipe. This was deemed a priority 1 project with an estimated cost of $972,540. Project No. 9- Replace Manhole 107,108,109, and replace 797 feet of 27″ Vitrified Clay Tile Pipe. This was deemed a priority 1 project with an estimated cost of $615,600. Project No. 10- Replace Manhole 113. This was deemed a priority 2 project with an estimated cost of $59,800. This grant program is available for Infrastructures; such as water, sewer, and stormwater; public facilities like senior and youth centers, economic development like construction of facilities and infrastructure that creates jobs, and community planning for engineering plans and needs assessments for public facilities and infrastructure. $20-$25 million is granted annually however, this is a highly competitive grant with Federal laws and regulations, a high amount of prep time, and evidence of need. Ideally, you will want to seek other funds first as this grant is awarded based on need. In order to be considered for Environmental Planning Grant funding, applicants must complete a Consolidated Funding Application (CFA). Applicants are strongly encouraged to work with their Regional Council to align their project with regional goals and priorities. Municipalities with a certain Medium Household Income of $25k to $100k are eligible for this grant program. New for 2018-2019, this grant program’s purpose is to facilitate the construction of Emerging Contaminants Projects by providing funding for the initial planning phase. The Emerging Contaminants Project Planning Grant Program offers grants to municipalities to help pay for the planning and development of an engineering report for eligible drinking water infrastructure projects that protect public health by removing or otherwise addressing emerging contaminants such as perfluorooctanoic acid (PFOA), perfluorooctane sulfonate (PFOS) and 1,4-dioxane. This grant program will provide planning grants of up to $50,000 to municipalities to fund engineering and planning services for the production of an engineering report for an Emerging Contaminants Project. The Green Innovation Grant Program supports projects across New York State that utilize unique stormwater infrastructure design and create cutting-edge green technologies. Administered by the New York State Environmental Facilities Corporation (EFC), the grant provides funding of a minimum of 40% up to a maximum of 90% of the total eligible project costs as provided in the application. A minimum of 10% up to 60% match from state or local sources is required. Grants are provided on a competitive basis to projects that improve water quality and demonstrate green stormwater infrastructure in New York State. Eligible applications for the Water Quality Improvement Program include Municipalities, Municipal Corporations, Regulated traditional Municipal Separate Storm Sewer Systems (MS4s), Soil and Water Conservation Districts, and Not for Profit Corporations. Water Quality Improvement Program Grants are administered by DEC. This program is a competitive, reimbursement grant program that funds projects that directly address documented water quality impairments. The NYS Water Grants program will grant up to 25% of project costs for sewer and 60% for water. This is great for stand-alone grant funding if you have the other 75% or you can utilize subsidized or 0% loans for the remainder of the project costs. An Engineering Report/ SEQR/SHPO/Bond Res is needed for this grant program. The Empire State Development Corporation will generally grant up to 20 to 25% of the project costs. The municipality and/or private company would have to fund the remainder of the costs. Water and sewer main, treatment facilities or related infrastructure projects that increase or extend capacity are eligible for this grant. The project however, must attract/retain companies and jobs. If you have a water or wastewater treatment project on the horizon, C.T. Male Associates civil engineering division can help! Our water and wastewater treatment services include all phases of the project from investigation and planning to grant funding services, permitting, and project implementation. If you are looking for a team to see the entire project through, simply fill out the contact form below or call 518-786-7400 to speak with a member of our engineering team.